There is no reason why we can’t enjoy a good meal, even when short on time. 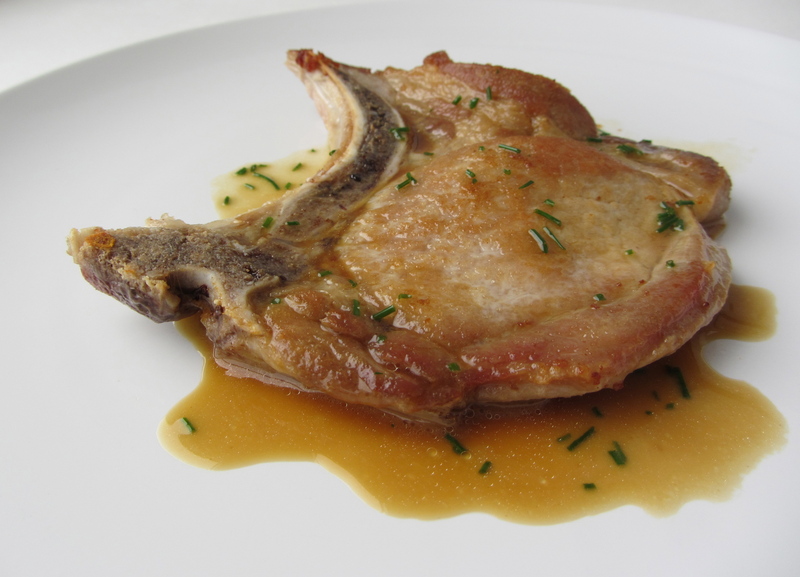 By using a thinner cut of meat, this pork chop cooks up really fast. And while the pork rests, a simple pan sauce whips up in no time to go with it. Quick and easy, just the way I like it! 1. Pat dry pork chop with paper towel. Season both sides with a pinch each of salt and pepper. 2. Preheat 1 tablespoon of olive oil in a medium skillet over medium-high heat. Once the oil is shimmering, add the pork chop and cook each side for 1-2 minutes until meat is cooked through with a nice sear. Remove chop from pan, cover loosely with aluminum foil. 3. While the pork is resting, make the pan sauce. Add the chicken broth to the pan to de-glaze, using a wooden spoon or whisk to scrape up the brown bits. Add the butter, continue to cook the sauce until is has reduced by half in volume. Spoon over pork chop to serve. * Flip the chop only once when cooking. By not disturbing the meat while it is in the pan allows for a nice sear, which makes for more flavor. * For more flavor, add in fresh herbs when making the pan sauce.